1 Select the joint guide and matching bit for the desired mortise & tenon size. Snap the guide into the table's guide recess. 3 Clamp your tenon workpiece onto the clamp plate, against the side stop fence. Move the table to sight the rear tenon position, lock the left, right and front limit stops against the limit posts. Then sight the front tenon and lock the back limit stop. This sets up the table for easy and accurate positioning, as you rout each successive workpiece. Note: Duplicate tenons can be routed without having to mark or sight the tenons. 5 First, rout the rear tenon in it's respective table position. 6 Move the table to the front and rout the front tenon in its respective table position. 1 Remove the tenon and router. Extend the sight, and clamp the mortise board to the jig with the mark aligned to the sight. 2 Place the router/sub-base on the jig table. 3 Rout the rear mortise in its respective table position as set earlier by the table limit stops. The limit stops allow for precise repeatable positioning of the table. 4 Rout the front mortise in its respective table position. 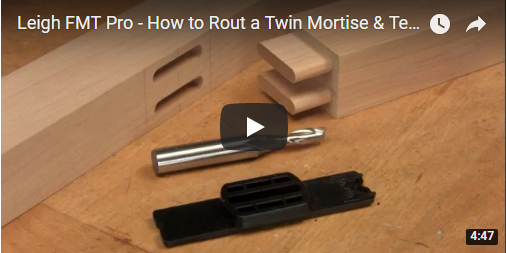 You’re now ready to join the routed mortises and tenons together.